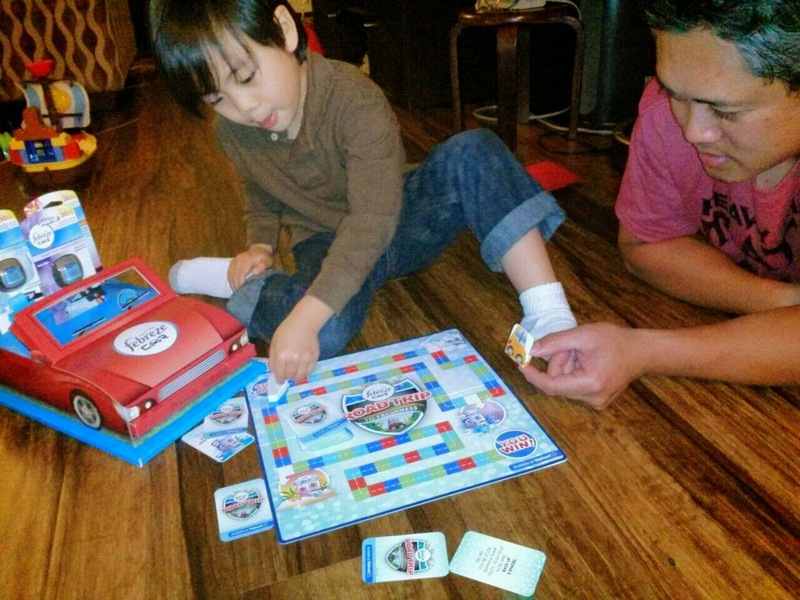 Febreze sent us their Car Vent Clips to eliminate tough car odors and the Road Trip to Freshness board game for a little family fun. Thank you Febreze! As a blogger, I really enjoy going to blogging and social media conferences. I love it when they happen to be within driving distance from where my family and I live. I always bring them along so that we can make a family trip out of it. Who doesn't love a family road trip?! Our in-car adventures have taken us to Las Vegas, Los Angeles, Anaheim, and Scottsdale. Relatively lengthy drives from our home is San Diego, especially with a little one. Being cooped up in car for hours is great family bonding time but it could also result in a smelly vehicle. Drive thru food smells are our biggest culprit on our road trips. Oh SURE, the grilled onions on a double cheeseburger sounds yummy and SMELLS delish... But hours later? Blech. Greasy french fries and cheeseburgers are fun road trip treats but you don't want to smell it for the entire drive! Good thing nobody EVER farts in the car! Giggle. You get the gist of it. Small car, big smells, no fun. I'll never get used the smell of lingering fast food odors. Nope. Not me. Your turn - please tell me about your smelly-mobile! Gym clothes? The forgotten french fry under the car seat? What causes stink in your car? OK, OK - since we probably don't want to air out what stinks, how about sharing your road trip memories? Please share your stories in the comments. Thanks! OK, enough of the gross car smell talk. Let's talk shopping and giveaways instead. If you enter our $25 Walmart giftcard giveaway you can drive on over to Walmart and do a litlle shopping. Maybe even pick up some Febreze Vent Clips while you are there. 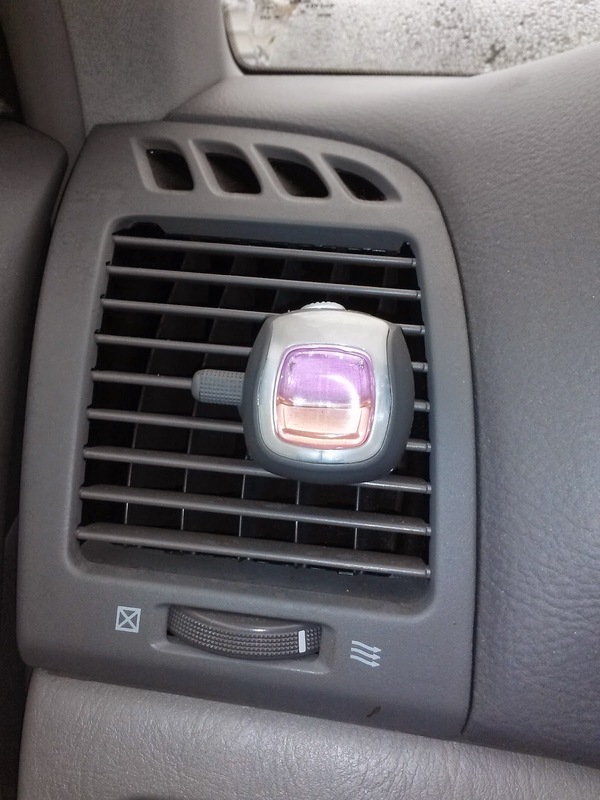 Febreze Car Vent Clip in action. I like that you can adjust the amount of fragrance. You can buy a single clip at Walmart and get another free. Febreze Vent Clips last up to 30 days. 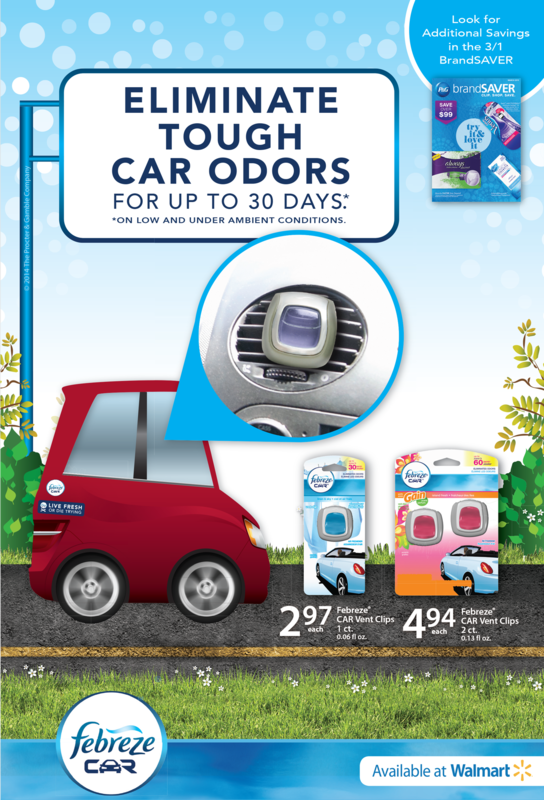 Febreze Vent Clips can help keep your car as fresh-smelling as your home. 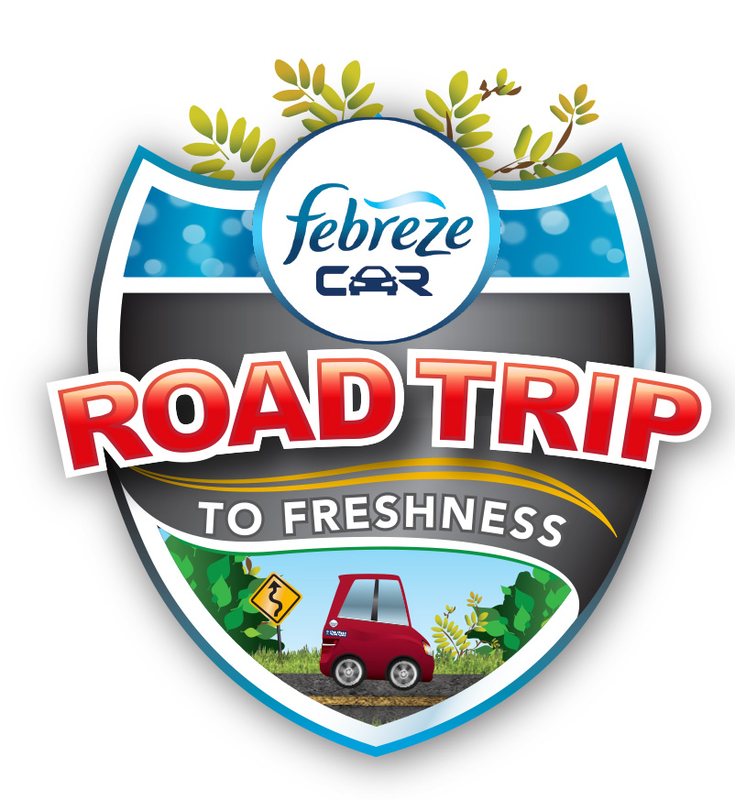 Playing "Road Trip to Freshness" and avoiding smelly incidents along the way. Please enter the giveaway using the Rafflecopter widget below. Open to U.S. residents 18 and older. SheSpeaks will provide and ship a $25 Walmart gift card to our giveaway winner. Winner will have 24 hours to respond, otherwise an alternate winner will be selected. For product information and promotions please follow @Febreze_Fresh on Twitter or Febreze on Facebook. a Rafflecopter giveaway I couldn't resist the urge to share our family video from our first Blog Conference Road Trip. Destination: Las Vegas. Here we are on the Las Vegas Strip with our then 2 year old. Fair warning, the video is unedited. Lifebycynthia unscripted! Disclosure: This post is written in partnership with SheSpeaks and Febreze. All opinions are mine. My family and I took a two week vacation,the best part was traveling from the warmth of So Cal to waking up to snow inNV. My children had never seen snow. Seeing the joy on their faces was priceless. I love that! We are close enough to sand and snow, just a drive away. I still remember our son's first time seeing snow. Priceless! One of my favorite road trip memories is playing the "License Plate" game with my mom while we were on the road. It was always a lot of fun to keep track of the number of states we saw represented on the road. We love road trips to Northern California. Priceless family memories have been made. I hear ya! After a few too many miles road trips can get tough. We drove to San Francisco for a family trip our son got sick and threw up.. It was on the way home and everyone was exhausted. I felt so bad for my littlle one! Cool! Road trippin' European style! That's one to add to our list of things to do! I love Road trips, but I have not taken one lately. I went on a road trip with my sister, nephew and brother and we had a blast driving all through Oregon and California! It was a Road Trip of a lifetime and it was so much fun! I hear that Oregon is beautiful. I've never been, not yet at least! I really don't like road trips but some of the best have been with my girlfriends just laughing and singing. Amanda, I have some great memories on our all girl road trips! Palm springs and Vegas with my best pals. Thank you for bringing back some cool memories! I luv road trips! Before we had kids, my husband and I used to jump in our car and go for an adventure. Three weeks before our first daughter was born we realized it was going to be a while before we went on a trip again so in the middle of the night we packed a suitcase and drove to Florida (we live in South Texas). Had tons of fun! Sound like you have had some great adventures! FUN! Road trips, thumbs DOWN if I'm with my two young grandsons! Now I know to bring ear plugs, LOL! Our last road trip to the beach they kept asking over and over how much longer until we're there. I do not go on road tips often but I do like them. When I was younger we went on road trips to see family and I had so much fun. We have only been on a handful. It's hard not to get a little anxious on the roads though. It can be a "not so safe" way to get around. Sadly, we've seen accidents along the way.Scary especially with our precious cargo. Farrah - Project Dumpling sounds AMAZING! I say thumbs up to road trips. I enjoyed them when my husband could navigate but they are harder once you have kids. Jessica, I'm with you - it does get harder with kids: more bathroom stops, "are we there yet", and the list goes on... Great memories though! We love road trips, but not with kids. They whine all the way to the destination. I'm all for road trips! The impromptu ones are the most fun. My favorite road trip was to Denver Co - beautiful state with lots to see! Barbara - agreed! My friend casually brought up Las Vegas and that night she and I drove out, just the two of us! Of course it was before we got married and had kids! Oh to be young and road tripping! I love road trips! We took 7 kids from Ohio to Hilton head in the middle of July one year. It was so much fun. I love to go on road trips! My favorite trip was a trip we took from MN to Colorado and then to Yellowstone. The mountains were gorgeous! I bet the scenery was breathtaking! Road Trips: Thumbs UP! My favorite place to go is the Black Hills. We love road trips just as long as I am not the one driving. I love to rubber neck. I'm the same way Bridgett, as long as I'm not in the drivers seat. That's very special stephanie. I wish that I had memories like that with my grandma. Thumbs up for road trips! We took a road trip to Florida a few years ago and had a blast! Thumbs Up! We love going on road trips! I remember years ago we went to Mount Rushmore and on the way home we were coming back through the Badlands. We thought it would take us a couple hours to go through....wrong! It was so beautiful and so much fun...we were there for 8 hours! Got home really really late in the night...but thats okay...we had such a wonderful time and such memories! Thumbs up for road trips. Our most recent long distance one was moving from Northern Arizona to Northern Idaho mid December in a little over 24 hours. We absolutely love it here. Thumbs up for road trips! We love to take day trips and the kids get to plan our adventures. Stay safe on the road with the kiddos Sadie! What a great way to build memories! THUMBS Up - best tip- make sure you have lots of snacks, good music and toll money. Erica - gotta give it try! You might love it!